Last week I taped a segment for Triad Today that focused on the prevention of childhood injuries. My guest, a noted Pediatric Injury Prevention Coordinator at Wake Forest Baptist Medical Center, suggested, among other things, that parents keep their children away from all-terrain vehicles. Coincidentally, before that segment could air, the Winston-Salem Journal ran a front page feature story about a horrendous ATV accident which had occurred back in January, and nearly took the life of 13-year-old Tyler Hughes of Clemmons. On that fateful day, Tyler got on his ATV and proceeded to drive fast along a snowy, curvy road. The ATV flipped over on him and the roll bar severed his left arm. 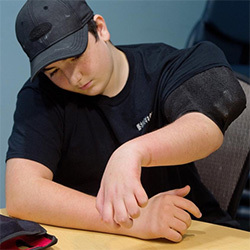 The headline of the story was, “Quick Thinking Mom, Skilled Doctors Made the Difference”, a reference to how Tyler’s mother Crystal had applied a make-shift tourniquet to her son’s arm, and how surgeons at Wake Forest Baptist Medical Center were then able to successfully re-attach the arm. It was a feel-good, human interest story with a happy ending, because Tyler is now almost fully recovered. It was also a grossly negligent story for what wasn’t written. The fact is, Mrs. Hughes should have never let her son operate an ATV in the first place. Don’t get me wrong. I have nothing against Mrs. Hughes, who acted bravely under pressure, but I do have something against ATVs. As far as I’m concerned they are nothing but noisy death traps. But don’t take my word for it. Based on data extrapolated from a 2010 Reuters report, there are about 11,000 ATV accidents every year, and, according to ATVsafety.gov, those accidents result in roughly 900 deaths annually. Even more troubling, the US Consumer Product Safety Commission says that ATV deaths involving children have accelerated since the new millennium began. Sadly, here in North Carolina, 45 people lost their lives in ATV accidents in a two-year period between 2014 and 2016, and that makes our state 9th in the nation for ATV-related fatalities. Shamefully, the Specialty Vehicle Industry Association (the ATV industry’s answer to the NRA), has tried to divert attention away from the inherent dangers of ATV’s, by blaming accidents and fatalities on people who take their 4-wheelers onto paved roads, instead of driving them strictly off-road. S.V.I.A. would also have us believe that simply wearing a helmet will prevent all serious injuries. In reality, that is more true for motorcycle riders than for those who ride ATV’s. During a 2010 meeting of the American College of Surgeons, it was reported that when the severity of injury is the same in an ATV as it is in a motorcycle, those riding the ATV are 50% more likely to need treatment in an intensive care unit, and 50% more likely to die. Why? Mainly because unlike motorcycles, ATV’s are mostly operated by minors. Tyler Hughes is the perfect example. He wore a helmet, but that did nothing to prevent the roll bar from cutting off his arm. So how, then, do we protect kids from being injured or killed on an ATV? It’s very simple, We keep them away from ATVs. The Consumer Product Safety Commission recommends that no one under the age of 16 should operate an ATV, and I agree. Our state lawmakers should embrace that recommendation, along with three caveats. First, is that the 16-year-old must also have a valid driver’s license even when crossing a public road. Second, the age restriction must apply regardless of the size of the ATV’s engine (current NC law allows kids as young as 8 years old to operate smaller ATVs). Third, the new law should apply regardless of where the ATV is operated, and that means no one under 16 can ride on an ATV even on private land. Without new laws that come with hefty fines, we’ll never be able to protect kids like Tyler from risking life and limb on an ATV. Think I’m overreacting? Then pay heed to Tyler’s own words, when he told Journal reporter Jenny Drabble that he “can’t wait to start riding again”. Children don’t know any better. Lawmakers and parents should.